Taxi driver Mesghina Ghebrehiwat traded a Ford Crown Victoria that gets 11 mpg for a Toyota Prius v that gets 40-45 mpg. 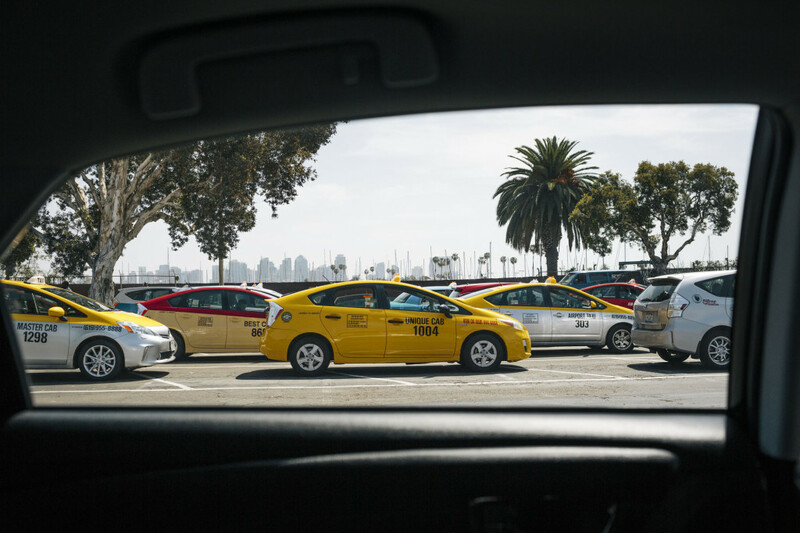 A hybrid helps this taxi driver save money on gas while cleaning San Diego’s air. San Diego’s Friendly Cab is operated by a man with soft eyes and a slight smile perpetually sneaking up under his barely gray mustache, 70-year-old Mesghina Ghebrehiwat. His business card, which doubles as a receipt, shows a pastel photo of the palm tree-lined streets of Asmara, the capital of Eritrea, the northeast African country where he was born, and an Eritrean flag in the shape of a heart. Asmara’s climate is very close to San Diego’s, where Mesghina has been driving a taxi for 14 years and where he goes by the name “Alex” – which is easier for his customers to pronounce and remember. Friendly Cab lives up to its name. You feel like you are getting something a little bit extra when Alex picks you up at San Diego International Airport. He carries water for his customers. His taxi, a Toyota Prius v, has leather seats. It’s quiet, of course, and unlike some cab drivers who like to gun it and then hit the brakes over and over until you arrive at your destination, Alex says he takes special care to drive smoothly. “It makes my customers happy,” he says, both of his driving technique and his Prius. When San Diego’s airport expansion occurred on the heels of the passage of California’s bedrock climate and clean energy law, AB 32, the airport agreed to reduce its greenhouse gas emissions as it expanded. The expansion would add traffic, so, among other measures, the airport offered lower fees to airport taxis to convert to hybrids. But while over time drivers save a lot of money on fuel and maintenance by converting to hybrids, the hard part is the cost of the initial purchase, according to Kevin Wood of the Center for Sustainable Energy (CSE). To help overcome this barrier, CSE offered a rebate to early adopters ranging between $2,500 and $7,500. The San Diego County Air Pollution Control District just approved more financing to convert more taxis using money from state vehicle registration fees. In all, 280 of the airport’s 350 taxis have upgraded from Ford Crown Victorias, which get about 12 miles per gallon, to the Prius v, which gets 40-45 MPG. According to CSE, a 2006 Crown Vic produces 8.2 tons of greenhouse gas (GHG) emissions per year; a 2012 Toyota Prius v produces 2.2 tons. So far, the clean cabs have reduced the airport fleet’s GHG emissions by 62 percent and smog by 90 percent. The taxi holding area behind the San Diego airport used to be filled with Crown Victorias, but now is filled with hybrid Toyota Prius due to incentives offered by Mossy Toyota and the airport in San Diego. In his native Eritrea, Alex drove big trucks, not taxis, and also owned a liquor store in Ethiopia, not far from his home. When war escalated between the two countries, he had to abandon his business. A long odyssey seeking safety for his family led him to Sudan, Saudi Arabia, Italy, and eventually to Portland, Oregon. Not caring for Portland’s cold, wet climate, Alex first moved to Bakersfield where he spent 12 years as an oil field driver. Then, when one of his kids got a scholarship to San Diego State University, he moved his family to San Diego. After a few years driving for Yellow Cab in San Diego, he started Friendly Cab. Using savings and money friends lent him, he paid cash, about $5000, and bought an old Crown Victoria police car with more than 100,000 miles on it. Every three or four years, he got a “new” old police car – just like most of the airport taxi fleet at the time. But the Prius v – newer, more reliable, with better mileage — is taking over the fleet. When the entrepreneurial Dale Snow, service director of Mossy Toyota, San Diego’s largest Prius dealer and Prius service provider, heard the airport wanted the drivers to convert to hybrids, he began showing up at the airport holding area with doughnuts and coffee. The pastries helped, but he encountered a fair amount of skepticism from wary drivers. “There were 300 Crown Vics there and we’d pull up in our Prius,” he laughed. Alex met Dale Snow at the holding area and became an early adopter, purchasing his Prius from Mossy Toyota in 2012. He’s one of the strongest advocates for the Prius because of the savings on gas and maintenance. Owners save up to $12,000 a year per cab in fuel costs. “My Prius is like my baby,” he smiled. He has a second driver at Friendly Cab, and between the two of them they keep the taxi running 24 hours a day, racking up 255,000 miles. And when Alex shows up at Mossy for an oil change, Dale makes sure he goes to the front of the line. Mossy offered the drivers zero down and low or no interest financing, driver discounts, free carwashes and preferred service. Mechanics trained in hybrid maintenance must go through additional training, but also make more money than conventional car mechanics. Mossy runs an internship program with a local high school where kids interested in an automotive career can come train to work on the hybrids. Dale says now that he’s gotten all the cabs at the airport he wants to turn his attention to the 1,200 city cabs in San Diego. Thanks to AB 32 and subsequent laws that provide funding to help all Californians switch from gas-guzzlers to cleaner alternatives, Dale’s plans may be just the tip of the iceberg.